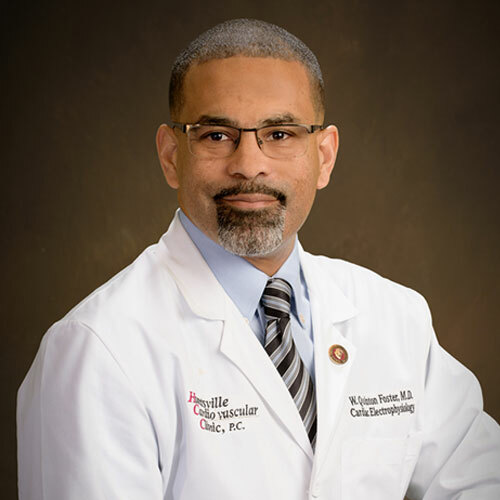 Dr. W. Quinton Foster, a native of San Diego California and graduate of Hampton University, earned his medical degree from Emory University in 2001, then completed residency at Emory and Grady Hospitals in Atlanta, Georgia. He was awarded an advanced cardiovascular imaging fellowship by Tulane University in New Orleans and was one of the physicians who remained in New Orleans during Hurricane Katrina. Dr. Foster completed a general cardiovascular diseases fellowship at Tulane, then continued his training as a clinical cardiac electrophysiologist with the University of Toledo Medical Center in Ohio, where he remained as an assistant professor, who enjoyed teaching, patient care, and research publication. Since relocating to Huntsville, he has been the first to implant the new MRI-conditional ICD in the Rocket City, the first to bring the cryoballoon atrial fibrillation ablation technology to North Alabama, and one of the first to implant the new Micra leadless pacemaker in the state. His main areas of interests include cardiac arrhythmia management, catheter ablation, and cardiac implantable device implantation and management (including subcutaneous ICD). Dr. Foster was selected for the inaugural class of Emerging Advocates for the American College of Cardiology, a two-year fellowship designed to develop leaders within the organization. Even though he has recently graduated from the fellowship, he still enjoys advocating for heart health every year on Capitol Hill in Washington, D.C. He is a fellow of both the Heart Rhythm Society and the American College of Cardiology. His other outside interests are, first of all, spending time with his family and then running marathons and doing genealogical research.